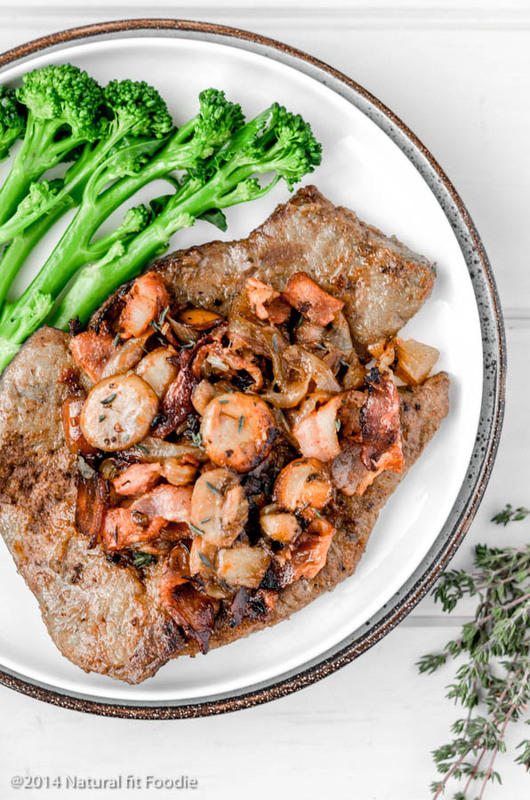 These tender, juicy beef liver and onions with bacon and mushrooms will help you develop a love for organ meats which are nutritional powerhouses in their own right. Beef liver is a fertility superfood. 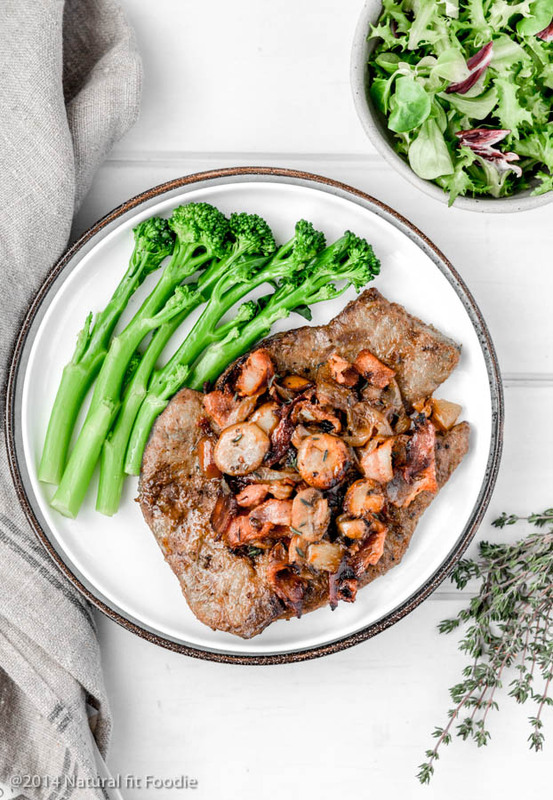 If you are trying to conceive or care about your fertility at all (which you should) then make sure you include beef liver in your diet. It is especially beneficial during your menstrual phase when iron levels are low. Say hello to beef liver and onions with bacon and mushrooms. Beef liver and onions is a pretty classic recipe. I have gone a step further and added bacon and mushrooms which really takes this dish over the top. Dry white wine and beef bone broth are used to make the most delicious gravy that you might even say makes this dish. As I was chatting with my mom about how I was going to prepare this dish she mentioned that my grandmother would always dredge the liver slices in flour before frying. Any starchy flour will work but I have chosen arrowroot flour which is gluten free. How long do you cook beef liver? If you over cook beef liver the meat will literally have the texture of leather. This you do not want I’m sure. Fry the beef liver slices for about 1 minute on each side for medium, half that time for rare. Bloody meat freaks my daughter out so I chose to cook mine for one minute on each side. How does beef liver taste? I grew up eating liver, not regularly, but I did have liver from time to time as a child so I know what to expect. Beef liver tastes unlike any other meat you’ll ever have. I’ll be honest and say that you’re not guaranteed to love beef liver on first bite but hopefully this beef liver and onions with bacon and mushrooms will convince you. Why do you soak liver in milk before cooking? Liver has a very strong flavour and can sometimes taste a bit bitter. If you soak the meat in cows milk for a couple hours before cooking it makes the flavour more mellow and palatable. Beef liver is the highest source of protein and iron out of all animal meats. It’s a fertility superfood, rich in folate, choline, and B vitamins vitamin B12, pantothenic acid, riboflavin, niacin and vitamin A. 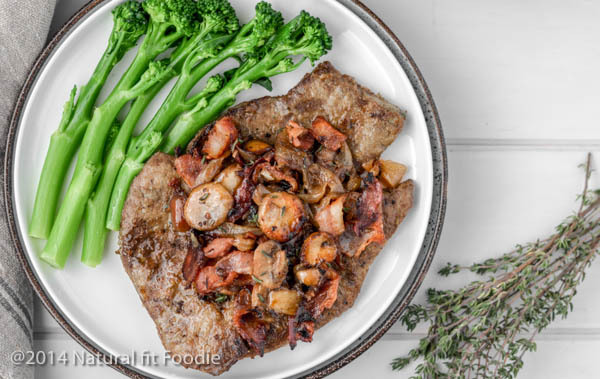 So what do you say, will you give this juicy beef liver and onions with bacon and mushrooms recipe a try? If your beef liver doesn’t come sliced, slice the liver into ½ inch strips. Fry bacon slices in cast iron skillet until crispy. Combine arrowroot starch, salt and pepper on a plate. Remove beef liver soaking in milk from the fridge. Dry the liver slices off with paper towels. Lightly dredge the liver slices in arrowroot starch mixture. Remove bacon from skillet, set aside, leave the bacon fat in the skillet because you’re going to fry the liver slices in it. Add liver slices to the skillet and sear for 1 minute maximum on each side. As liver slices are cooked, place them on a plate. Once you’re done cooking liver slices it’s time to make the onions and mushrooms. Add a knob of butter or coconut oil to the skillet and saute the onions until tender. Throw in the mushrooms with the onions. Add the fresh thyme. Remove everything from the skillet to the plate with cooked liver. Add the stock and wine to deglaze the skillet. Cook on medium heat until the liquid is reduced to a thick sauce. 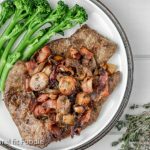 Return EVERYTHING to the skillet, beef slices, onions, bacon and mushrooms, warm through and serve. Enjoy!! My family enjoyed this with broccolini and fresh green salad. I actually quite like eating liver, thought I specifically like the one my mom makes. I have no idea how she makes it, but it’s delicious! I can’t do dairy. Can I soak in coconut milk or does it specifically have to be cows milk? You can certainly try it Randi. I’ve been experimenting with liver and onions for a few months now. With this recipe, I made the BEST version I’ve made so far! Liver was the juiciest I’ve ever made it. I was reluctant to add bacon bc I’m lazy and didn’t want to cook it, but it was so worth it. I was also glad I bothered to get fresh thyme. Thank you for sharing this one, I’ll be making it again and again !!!! Yesssss!!! I converted my family with this recipe too. So happy you enjoyed it!